Wet/Dry VACs . . . The VAC-200 is the same as above but includes the optional pump-out system for wet environments. 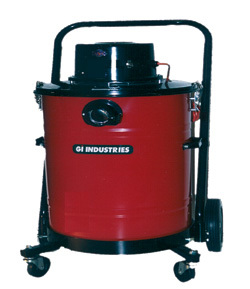 This unit will vacuum up water/liquid, contain it in its 15-gallon drum and pump the fluid out by turning on the switch. Just plug the unit into any 15-amp circuit and turn on the switch. Inside the unit a disposable bag captures the majority of the debris. Fine particles are then removed by filters. What makes our commercial vacuums better?